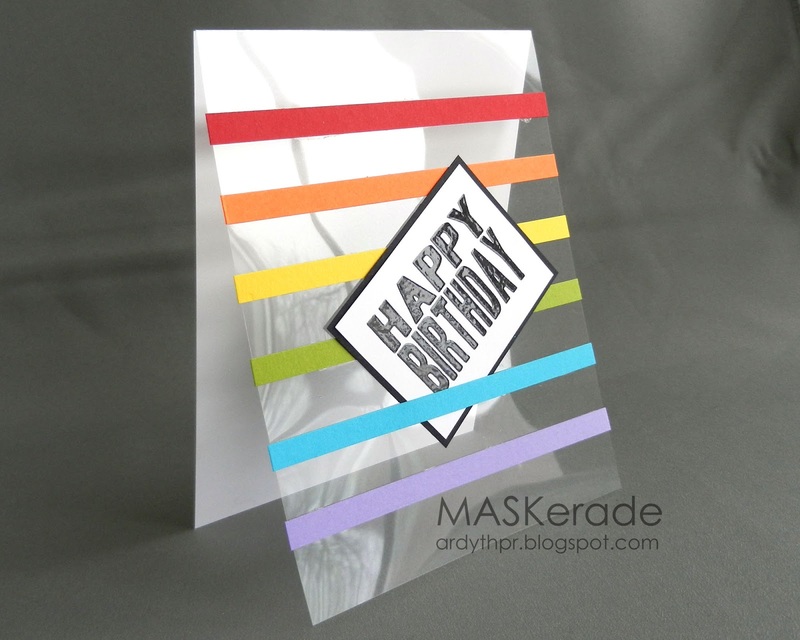 MASKerade: MoMA Inspired: Happy Birthday! I immediately thought " A bunch of rubber bands and an acrylic frame?! I could MAKE that!" And so I did! I found working with a transparency a little fussy, but you could do it with a white background - the beauty of this design is that it's versatile - change the colours and the sentiment and you're good for just about any occasion! OH MY OH MY! I love it Ardyth! this is fabulous... might have to make one of the notice boards!! Wow, this is so striking, love it! And you're right, so versatile. Wow! I love this...fabulous design...the transparency is so cool! This is awesome Ardyth! I LOVE it! One question, did you use a reg. card size piece of window sheet and place the white on top of the inside? Thank you! Pinned to CASE! I am a follower of your Inspiration Pinterest board. I look at what you choose -- I go blank -- YOU create wonders! :) You got it down sistah! Super inspired - you and me. Oh my word! So cool! Stunning! Love the embossed sentiment - such shine! Love that it is transparent. I love how your mind works and how you find inspiration everywhere! This is gorgeous! I am so intrigued with your brain, Ardy. And so jealous! I think I get how you did this, except for how it looks like a crinkled sheet of paper behind the acetate, before the white back? Is that just a photographic "design" or some kind of new party in my head or part of your design? You amaze me. Simply INCREDIBLE and beyond COOL!! !